What Is The Role of a Decorator? When I am contacted to take on a project with the specific request that I make structural changes, I explain that I am a decorator and not a designer and that my role begins after the structural work has been planned and completed by a designer or architect. A decorator is an interior stylist [so to speak] involved in the "adorning" process which includes selection and installation of: walls and floors; lighting and other fixtures; window coverings; furnishings; and art work. The important difference between an interior decorator and an interior designer is that a decorator works to finish a space while a designer alters the structure of a space. 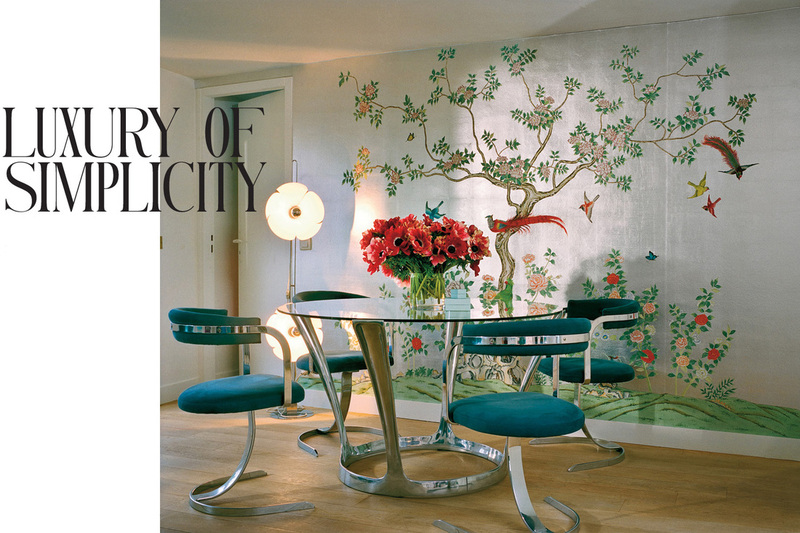 If a space only requires surface transformation, you call a decorator. If the space requires walls to be removed or built, you need to call a designer. Decorators can definitely get involved in space planning [for example, kitchens and bathrooms] but only when walls, ceilings or floors are already in place. Decorators always leave structural changes to a designer or architect. Decorators do have the knowledge and experience to tackle installations that do not require permits. The only exception to this rule is electrical work which every decorator normally tackles in any project requiring lighting. In the province of Ontario, a decorator will always hire a licensed electrician to ensure the work conforms to the Ontario Electrical Safety Code and can pass an inspection by the Electrical Safety Authority. Other installations like custom made built-ins or art work do not require permits and are part of the work a decorator expects in any project. Contact CULTURED IMAGE+ for more information on upping the aesthetic quotient of your interior spaces. Did you know that colour is one of the most significant forces of energy in the universe? It should not be underestimated in its ability to affect and control human beings. ​Colours are wavelengths of electro-magnetic energy that we absorb through our eyes, the sensual organ of sight. The colour of visible light is determined by its wavelength. White light is made of all of the colours of the rainbow because it contains all the wavelengths. The colour black is the absence of light and has no wavelength. In many places in the ancient world, colour played a role in managing illness. In Egypt, there were halls of healing where people entered and were bathed in light filtered through coloured glass panels. Those who suffered were also dipped in tubs of coloured pigments to cure their malaise. Another method of colour healing involved the grinding of coloured crystals and gemstones that would be ingested. ​Today, alternative healers continue to use of colours in their practice. Called Chromotherapy, (a.k.a. Colour Therapy), different coloured sunglasses (colours used are dependant on the ailment) jump start the patient by causing an added boost of energy, based on the wavelength of the colour entering the eye, that then affects the part of the brain that corresponds with a part of the body that aligns with that specific colour. That energy boost allows that person's own internal healing mechanism to become mobilized into greater activity. If you look carefully at the word disease, you quickly realize it contains 2 parts: dis and ease. This means "feeling uneasy" which implies the origin of illness is in the mind. 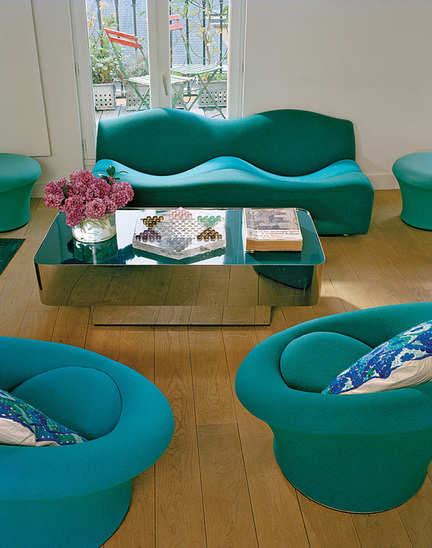 If colour can bring a state of ease to the mind, this can assist the body to relax and regenerate. The art of utilizing colour to create a particular mood or state of mind can be transfused into the realm of creative fields. If colour can morph the physical body and the energy field of an individual, imagine what it can do to influence people who visit a space. Colour therapy can and should be a top priority in the design field. If certain colours are used to heal, they can be manipulated to cause other responses. ​So, in the same way that colour can be used to influence the mind to heal, colour can also be used in design to affect an atmosphere in a space. Everyone who enters a room or area will have certain feelings and emotions stimulated by the colours displayed. Colour is an expressive force and directly and dramatically impacts how we feel about something. Imagine if you do not like the colour maroon - a dark brownish-red - due to cultural or personal preferences. Maybe this colour reminds you of dried blood. If you walk into a space that is painted with maroon walls, you will immediately feel a sense of disgust or discomfort and want to leave. Maroon is a good example of a colour that is not recommended for use in a commercial space as it rates as one of the colours that has a connection to blood, an organic matter that is essential for life but in copious amounts, is perceived to be negative as it connotes hemorrhaging, profuse bleeding, illness, etc. The strong symbolism of colour can also be learned depending on past traumas or cultural associations. For instance, if someone was crossing the street and hit by a yellow car, it would be normal for this person to despise the colour yellow. This is an individual case and cannot be anticipated. However, cultural associations can be predicted and used when a commercial space is involved in setting up offices in different countries or trying to appeal to clients from a cultural group. For example, there are certain cultures that promote the use of certain colours for certain occasions thereby connecting certain colours with positive and negative associations. In the West, white is worn at weddings but throughout the Indian subcontinent, white is the colour of death and is worn at funerals. In terms of using colour as a healing mechanism, this is a powerful concept that can be applied to decorating commercial spaces. Imagine the potential and possibilities for inducing a state of mind that produces extremely positive results for a firm looking to increase sales or promote its brand in the most favourable light (and colour is, as mentioned earlier, created by light). Since 1992, Hermès has kept a small footprint on Toronto's Mink Mile stretch. The new and much larger retail space, unveiled this past month, is just a few doors down. Somewhat reminiscent of the New York City flagship retail space, it has nothing new to offer in terms of interior inspiration. Although the unveiling was highly anticipated, it is a downright disappointment in terms of its bland interior design. I was expecting so much more from RDAI, the Parisian architecture agency that works with Hermès to design its retail spaces. The Toronto space has immense potential on its 2 floors with high ceilings. It is beautifully crated but oh so boring in its neutral, lacklustre colour choices. Hermès is a brand stuck in a time warp with no real innovation, no creative edge. What everyone wants to see these days in design - whether products or interiors - is edge and this space has none of that. It's a flat-line on a heart monitor, all smooth, round corners with no soul, no life. Just a blank space with wood trim, a giant swirling staircase, travertine-type marble floor, and a floor outline in one of the brand's mot recognizable china patterns. Just the usual suspects. The difference between the Hermès identity and the Prada identity is highlighted in the visual difference of the 2 retail spaces. One is highly conservative and offers nothing new in the way of colour or installations. The other is forward-thinking yet manages the impossible by innovatively incorporating residential aspects into the décor. Spaces are the first visual cue of a brand, before consumers even eye the products. Retailers should be savvy enough to know consumers aren't buying the actual products, they're buying the way the brand makes them feel. Would you want to buy products from a space that is stuck in a time warp that connotes minks and heavily fragranced parfum from your grandmother's generation or would you rather buy the products of a brand that showcases itself in an ultra-exclusive blend of retail space and residential cozy style that screams the definition of relevance and modern luxury? It's ridiculous how obvious is the choice. ​Contact CULTURED IMAGE+ to learn more about our unique Cultural Image Service to effectively use colour in professional spaces to refresh and modernize your firm's visual identity. know the word it relates to in a language. But identifying tints, shades and tones is much more difficult, not with the eye, but with language. What do you call a green-blue with a touch of yellow? Each colour has tints and shades. A tint of a basic color is a lighter version. A shade is a darker version of that colour. The term tone describes the lightness or darkness (tint or shade) of a basic colour. In colour theory, a hue refers to a pure colour without tint or shade (added white or black pigment). A hue is an element of the colour wheel. Colours with the same hue are distinguished with adjectives such as "light blue", "pastel blue" and "dark blue". ​Because there are major psychological effects caused by viewing a tint or shade of a colour. For example, a light blue has a very different effect on a person than the effect of a dark blue. These differences need to be understood and the correct language communicated to identify them when designing a colour consultation. Contact CULTURED IMAGE+ to learn more about our unique Cultural Image Service and how we can help your firm to use the right colours to trigger the desired psychological response. More and more firms are realizing the importance of the LGBTQ market and targeting products and services directly to this increasingly powerful group of highly vocal consumers. ​So which colours do LGBTQ consumers respond to? Well, of course, the rainbow, which represents the original flag and global symbol of the movement for gay rights. ​But we have moved beyond the designation of "gay" and are embracing a sexual and gender fluidity in our society that goes beyond LGBTQ. Now, there are specific flags and/or colours used to designate the variety of groups within the community. Please see the image to the right for details on which colours represent which groups. Not only does it make business sense to speak to this influential consumer group, it is a societal imperative to advocate for inclusiveness. Your firm can begin this process by representing your support by using certain focal or accent colours in your spaces to represent your value for diversity. ​Contact CULTURED IMAGE+ to learn more about our unique Cultural Image Service and how we can help you use the right colours to represent your support for diversity. ​Red​: Attracts attention and makes people stop, notice and, especially for straight men, makes them aggressive (red represents female fertility) and results in the immediate action of buying or wanting to buy. Red should only be used as a focal colour as too much red can cause people to back off (red is seen in as exclusive which can be perceived as excluding). ​Blue: Makes people trust and, with products and services, it makes consumers trust that when purchased, there will be fulfillment of claims made or that inherent or assumed qualities are reliable [i.e. if the product is toothpaste, it will be immediately assumed the toothpaste is reliably effective]. ​Gold: The colour of luxury and implied wealth! Gold makes people think of gold, as in the precious metal. Even budget products or services are immediately elevated when this colour is used. There is a difference between gold metallic and golden [not orange, but a shade in the yellow-orange tone] but both convey a similar feeling of prestige. Silver: Another colour visually related to a semi-precious metal; it also automatically enhances prestige, especially for European and Asian markets. ​Black: This colour is intense and add drama and impact, especially when used with white. People will always assume there is a creative element to what is being offered, whether it be a product or service. Pink: This attracts most females, LGBTQ and gender fluid segment of the marketplace. These are children, teenagers, young adults, and those 35-70 years who want to be perceived as younger and feminine. Make no mistake, this is a powerful demographic that accounts for a huge slice of sales. Pink is guaranteed to sell anything targeted to consumers who associate themselves with being feminine. The colour is also used as code for LGBTQ. Note: The Apple 5S iPhone was offered in 5 colours and pink was the top-seller generating almost 50% of sales! Contact CULTURED IMAGE+ to learn more about our unique Cultural Image Service and how we can help you use the right colours to target demographics and boost your sales. One way to section a large commercial space without making structural changes is to use colour. To visually identify different areas, colour coding is effective. If noise is an issue, partitions can be used [LOFTwall makes incredible room dividers and privacy partitions] and still allow the visual impact to be clear when entering a space. 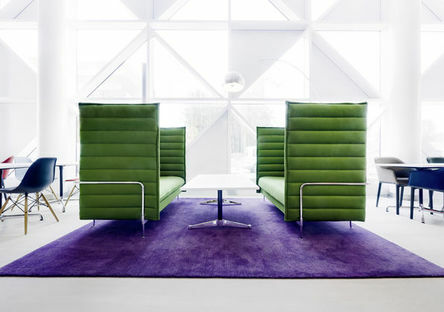 For example, green furniture can be used to identify accounting, red is good for sales and purple for creativity. Contact CULTURED IMAGE+ to learn more about our unique Cultural Image Service and how we can effectively use colour to create a productive and appealing environment for both your staff and clients. Colour I.D. : Louis Vuitton's New Packaging is Gold, Not Orange! The recent change in Louis Vuitton's packaging from brown and black to "Safran Impérial" [a honey-gold] combined with royal blue text is a significant and bold move on the part of a global leader in luxury goods. This shift demonstrates its quest to 1) lift the house from the dark brown which represented stiffness, boredom and tradition and draw attention to the brand by brightening its visual identity and 2) fully capture the Asian markets which are drawn to colours in the orange/yellow/gold range. ​It needs to be understood the colour LV is using is not a true "orange". Instead, it can be correctly identified as a honey gold. ​France is a country known for its love of using gold toned hues combined with blue in décor and LV is capitalizing on this French tradition to convey the French heritage of its brand. Yet, LV has reduced the tonal impact to a much softer version with a golden touch to ensure it still retains its North American market [which often associates shades in the orange tone with lower valued brands to the extent that even ultra-luxe brand Hermès had to scale back on its use of orange]. Safran Impérial is not a new shade for the Louis Vuitton house. Close to the natural colour of untreated leather, it has been a part of the leather goods maker’s brand heritage for more than 150 years, used in many of Louis Vuitton’s traditional pieces from the brand’s history. Imperial Safran was first seen in the "Citroën" trunk, commissioned in 1924. This trunk was created for an expedition in Africa launched by the French automobile firm Citroën. LV has its finger on the pulse of the golden age of travel where the global elite see the planet as their playground with no borders. ​Louis Vuitton is reaching back into its archives and really setting itself a new course for its French luxe appeal in markets other than North America while still managing not to eliminate its North American base. The house has also decided to enhance its modernized image and align itself with sustainable practices by using raw cotton for its fabric packaging. The camel coloured cotton fabric used to wrap items before placing in boxes has changed to a white/ivory colour to fully indicate the use of the raw cotton. Contact CULTURED IMAGE+ to learn more about our unique Cultural Image Service and how we can effectively use colour to create a visual identity that aligns with your firm's products and services. In a study by a Canadian researcher titled “Impact of Color on Marketing,” results indicated people make up their minds within 90 seconds of their initial interaction with a person, object or image. About 62‐90 % of the assessment is based solely on colour. ​Besides a firm's name and logo, a visual identity includes physical spaces. We have established above that a huge component of response is colour. Therefore, the correct use of colour is crucial to emoting a positive response. Offices and other spaces exposed to visitors must be decorated with colours that positively impact the snap judgments being made about the firm in the first 90 seconds. The relationship between a visual identity and colour hinges on the perception the colours used are appropriate. In other words, a colour that is universally perceived as light and feminine, for example a pastel pink, would not "fit" in a law firm or bank or any other business involved in activities associated with more masculine traits like aggression. ​Red is a difficult colour to use as it is gender reactive (affects males and females differently). It is perceived in every culture as strong (colour of blood, the life-force). However, males react to blood (and the colour red) very differently from women. Men are attracted by the strength of its visual tone, but mens' association with blood is to make a connection to violence and war and this activates a primordial defense reaction which causes aggression (negative). Women also immediately take notice of red. However, to this gender, red implies fertility and sexuality (for obvious reasons) and most females feel comfortable with this concept which causes feelings of arousal (positive). Elizabeth Arden is a spa services and beauty products brand that has successfully used red as its sole visual identity ("Red Door" image) because it mainly markets itself to females specifically looking for services and products that will make them sexually attractive. Red is a colour women believe will aid them in attracting attention from men but the rub is that it is not always the right kind of attention they will receive (red is a colour that makes men agressive because it makes them feel threatened). Elizabeth Arden is not affected by the negative reaction of males to its red visual identity as its marketing is focused on females who react positively to this colour. Orange is a vibrant, cheerful and completely positive colour but due to its recent adoption in logos for very large and popular North American companies selling utilitarian and budget-level products or services, the psychology of consumers has been influenced to perceive this colour as representing these attributes. Such is the power of branding that it can actually shift culturally in-bred and psychologically based reactions to colour and cause established brands that have built their brand on a colour to make changes. ​For example, Hermès, the luxury brand steeped in French culture and tradition, has always been associated with the colour orange which is part of the French Country ​décor style. In fact, there is a term called "Hermès orange". But look closely at Hermès storefronts worldwide. They are all different yet none include orange. It is clear Hermès is morphing away from its "orange" roots as even the interiors inlude only a few products in the famous Hermès orange used as decor accents. ​​Contact CULTURED IMAGE+ to learn more about our unique Cultural Image Service and how we can effectively use colour in your spaces to create a visual identity that aligns with your firm's products and services. Art Deco, also known as Deco, is a streamlined, geometric style that came of age in the 1920s and 30s. Its name is short for Arts Décoratifs (from the Exposition Internationale des Arts Décoratifs et Industriels Modernes held in Paris in 1925). ​Deco was applied to interior design, furniture, jewelry, textiles, fashion, industrial design and architecture. Art Deco was created by melding: the bold geometric forms of Cubism; the daring bohemianism of Fauvism and the Ballets Russes; the updated craftsmanship of the furniture from Louis Phillippe and Louis XVI; the exotic styles of the Middle East, South East Asia and the Far East; as well as Mayan art. It featured rare and expensive materials such as ebony and ivory and the finest of craftsmanship. 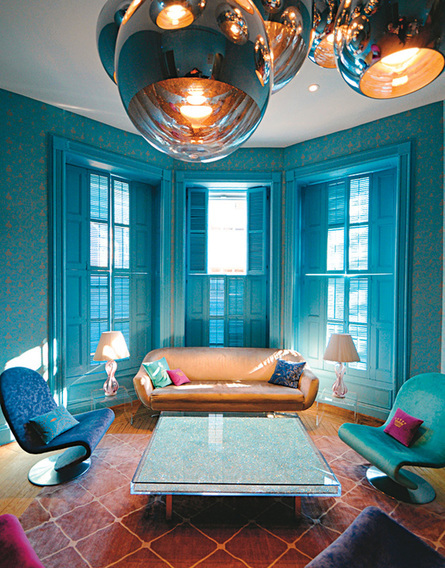 When Deco is used in interiors is truly the cultural melting pot of the decorating and design world. As it is a melange of influences from around the globe, it is not only multicultural in its references but is an all-cultural design style. The cultural similarities between Deco and a broad range of global style tastes and preferences make it an excellent choice when looking to appeal to a wide audience of varied cultural backgrounds who have a more modern and edgy sophistication. Deco's clean lines always ending in a flair and its emphasis on symmetry, suit an upscale or ultra-luxe commercial environment. ​No matter what country or culture a person relates to, Art Deco will always speak to them due to its many different cultural references! ​Colours for Art Deco are mainly neutral to imply minimalism: beige, tan, taupe, brown, black, light grey, silver and white with bold colours used sparingly as accents. Brass and other shiny metals are used extensively and glass also feautures prominently as a material. Fabrics and other materials used in commercial spaces in the province of Ontario are categorized separately from residential fabrics due to fire regulations. Materials used must comply with the requirements of the Ontario Fire Code and the Ontario Building Code. ​Contract fabrics have come a long way and there are a plethora of stunning options available. However, depending on the project, sometimes we can source fabrics that are not specifically made for contract spaces but can still meet Code requirements if the fabrics clearly state they pass the Flame Test. As well, smaller fabric covered items such as pillows and chairs can be finished with a fire retardant spray. ​The Codes maintain these regulatory requirements mainly for drapery and window coverings as these can easily be ignited. 2.3.1.1 (1) Where a building is refurbished or redecorated, interior finish materials shall be in conformance with the building code. pass the match flame test in NFPA 705, “Recommended Practice for a Field Flame Test for Textiles and Films”. Brighter colours and exotic patterns in textiles and tilework were previously viewed as unsuitable for contract environments. Times have changed! Welcome to the cultural revolution in Western commercial interiors. 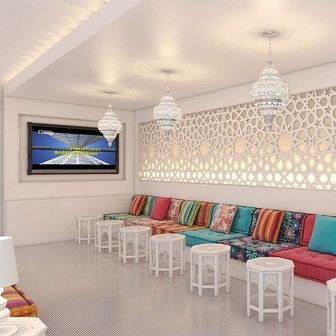 Exotic textiles and patterns using other materials are enjoying considerable popularity in Western interiors including commercial projects where they can be used sparingly as cultural references to signal a firm is globally connected and has a sophisticated edge in its business activities and reach. The status quo of relying on contract materials for professional spaces [in the interest of economy and durability] is no longer a relevant design choice for a firm looking to promote itself as having its finger on the pulse of global connectivity. Materials specially fabricated for use in commercial interiors are very limited in selection and not even relevant to the current mainstream taste level. A chic, upscale firm targeting international markets and sophisticated clientele needs to stay current in its visual identity and broaden its décor impact with global design references. 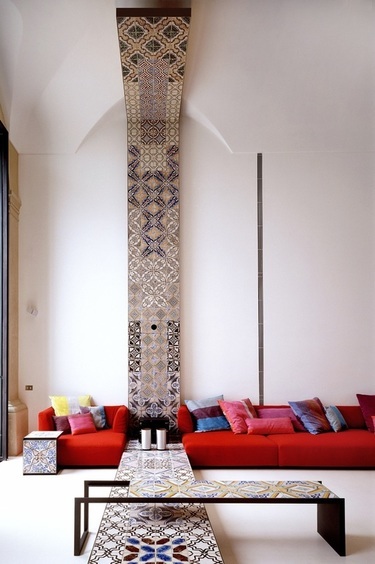 Commercial spaces can incorporate ethnic patterns in accents such as genuine cottage industry handcrafted cushions or Mediterranean tiles. 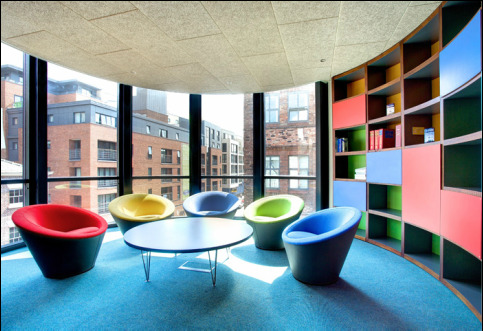 These pops of colour and pattern create interesting and dynamic spaces in a professional setting. ​Let's understand how important colour is to the success of your business. ​On the other hand, many poor quality or sub-standard products are successful and retain a large market share simply because the right colours are being used in their packaging. * Colour matters!! ​Now let's use this knowledge and apply it to something else you package. Your professional space is a product and the design and decor of your spaces is another way of packaging your brand. So, how are you packaging your professional spaces? What are the colours used in your space communicating to your visitors? Are the colours in line with your firm's brand and visual identity? 1. What is your firm is offering, products or services? 2. What is the industry category of your firm? 3. What are the market demographics of your firm's customers or clients? 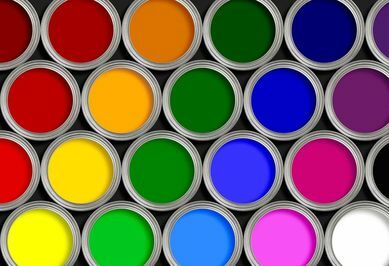 ​The answers to these questions and many more will determine the correct colours to use in decorating your firm's professional space. ​Remember, your professional space is a product and it needs to be packaged effectively. Contact CULTURED IMAGE+ to learn more about our unique Cultural Image Service and how we can mix and match hues and create effective color schemes that correctly package your firm's professional space and psychologically works to enhance the value of your business. 60 percent is Subordinate, or the Base colour. This is a visually weak, or subordinate, colour. It should contrast or compliment the dominant colour. 30 percent is Dominant, or the Main colour. It is this colour which defines the communicative values of the combination. 10 percent is Accent, or the Highlight colour. The Accent colour can be two things: either sympathetic to the Subordinate or Dominant colour, or it can be visually strong and striking, therefore appear to be competing with the dominant colour. This can provide tension and creates interest. In any space, if there is too much or too little of Dominant, Secondary or Accent, there will be an unbalanced visual result. 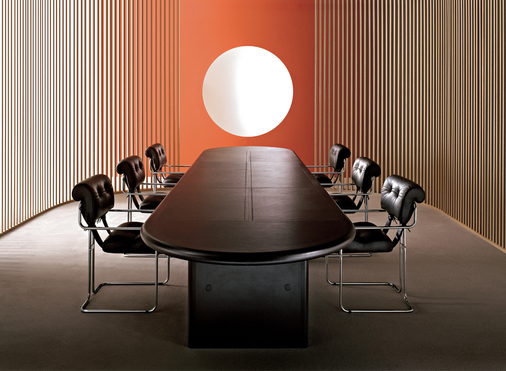 Colour choice is essential for a firm's image. Whether you are selling products or services, your space needs to reflect the correct colours to represent your brand and visual identity. Contact CULTURED IMAGE+ to learn more about our unique Cultural Image Service and how we can mix and match hues and create effective colour schemes that align with your firm's identity. 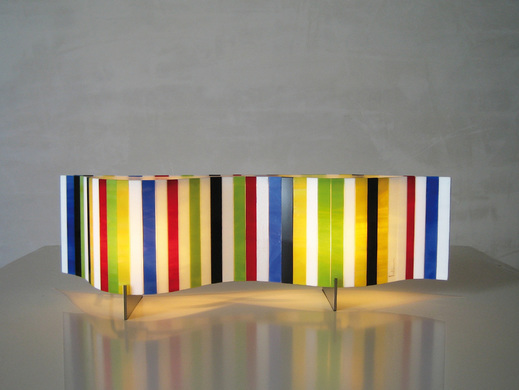 Arturo Alvarez, master of 'emotional light' fixtures, has created​ Ventopop, a tribute to Pop Art. This exclusive and limited edition comes from the Vento collection. Inspired by the rebelliousness of the movement, these lamps and pendants reflect the irreverence of those days through the lively chromatics of the glass forms. An impressive color symphony that surprises and delights the observer in its pendant, grand floor installation or table lamp. Contact CULTURED IMAGE+ to learn more about our unique Cultural Image Service and how we can enhance your firm's professional space. 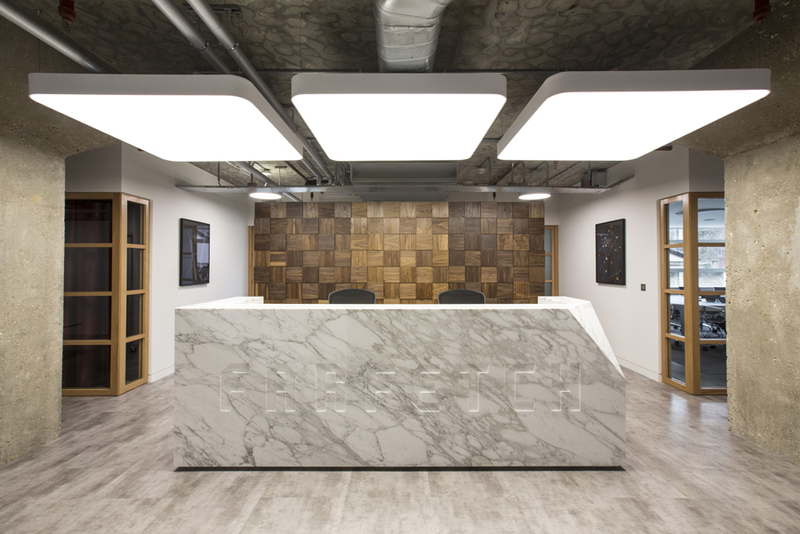 This striking example of a commissioned wall installation in an office is a testament to the power of thinking out-of-the-box when it comes to decorating professional spaces. 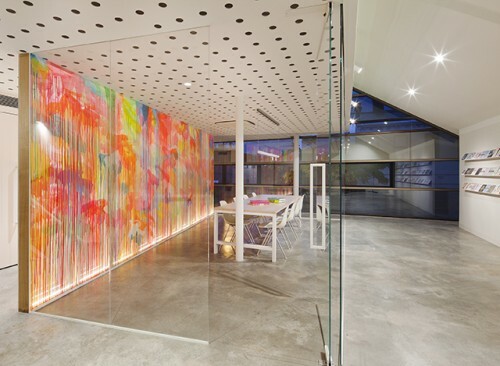 The brightly coloured wall of this conference room is entirely constructed out of the art work which is a painting on glass by an Australian artist. When privacy is required in open concept professional spaces, no walls are required. Look to Vitra's Workbays for the non-reno, cost-effective solution. These modular units create distinct areas similar to rooms where individuals or groups can retreat from the general office environment to carry out specific activities. The units come equipped with everything users need: work surfaces, seating and optional storage and power connections. What makes Workbays so unique in the world of office furniture is their height, which allows for greater privacy, plus their incredible ability to almost completely absorb disruptive sounds in the surrounding environment. 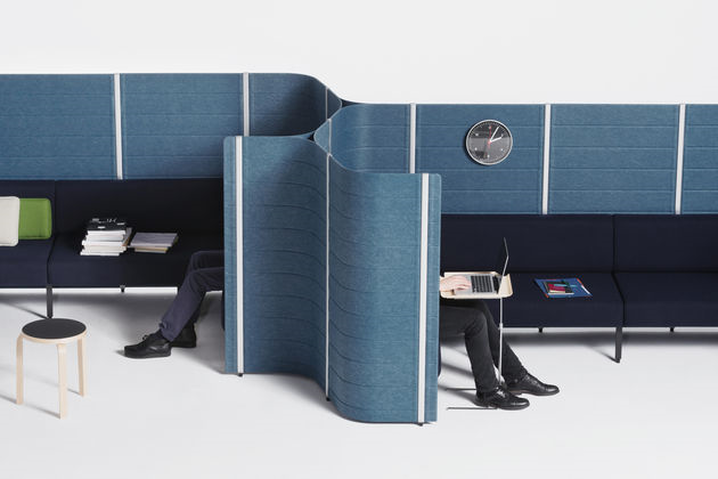 They can spontaneously serve as telephone booths, video conference rooms, reading corners, quiet spots for a coffee break or meeting rooms – without sending participants behind closed doors. Subtle yet striking in their variety of designs and colours, Workbays add definition and structure to a room. Workbays installations are easy to plan and can be integrated into virtually any space. They can be combined, expanded or adjusted as needed to meet changing conditions. Versatile and lightweight, the units are simple to install anywhere in the room – with no noise, no mess and no damage to the building. Sheila Hicks is an American artist who has lived and worked in Paris, France since 1964. She is known for her incredible ability to turn fibres into monumental statements and her craftsmanship is undeniably unique. Hicks' creations are revered not only for their visionary configurations and use of colour but also for their integration of cultural influences [collected over the artist's many years of living and working in all of the major continents]. Hicks' global creative adventures include living in Mexico prior to her move to France in 1964, receiving a Fulbright grant to study and paint in Chile, travelling extensively in South America photographing archaeological sites, working as the art director for the King Saud University in Saudi Arabia, working in carpet studios in Morocco and working on commissions in Japan. Clearly, this artist is the true personification of the terms 'worldly' and 'cultured'. ​Curated works are exhibited each year in different continents with an upcoming exhibit in in Hangzhou, China from 25 August - 25 October 2016. 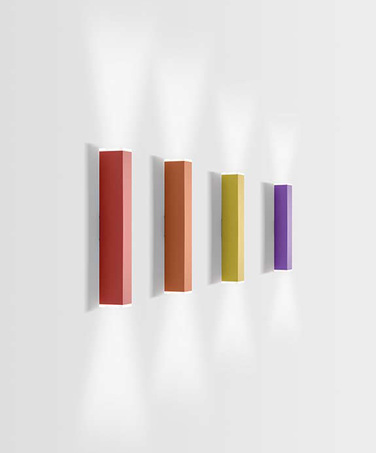 Hicks' larger installations are perfect for commercial spaces with large walls. ​Contact CULTURED IMAGE+ to learn more about our unique Cultural Image Service and how we can enhance your firm's professional space with art and décor to communicate an industry attunement with a global vision. Why is this lobby prototype comparable to a highway? Because it only serves as a thoroughfare for commuters. There are no visible seating areas and the vast expanse of space has no life in the form of décor. A few oversized artworks and only one chair make this white and grey toned lobby a colourless and empty space people will speed through. Sterile, cold lobbies like the one in this image actually do exist in the real world. Why are empty, colourless lobbies a problem? Because people only use them to walk through making this a wasted space and a wasteland of missed connections [people passing each other and unable to meet or network]. This reflects very poorly on the company whose name is on the building. 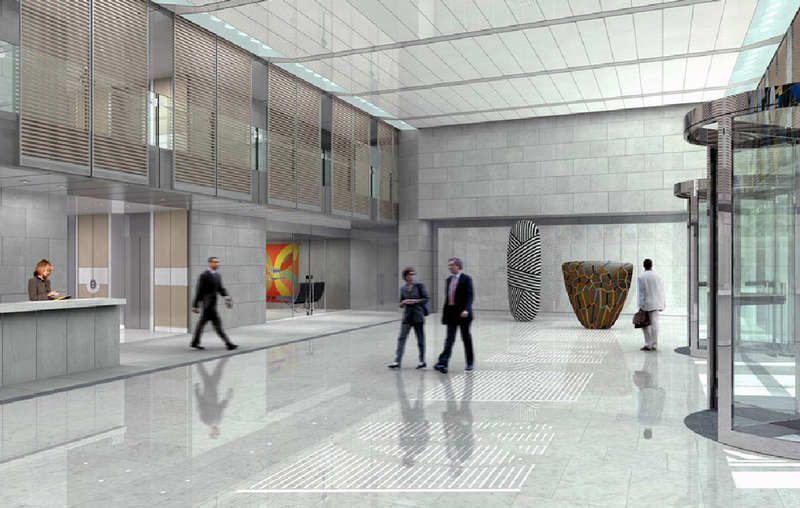 A lobby without enough décor or furniture is a disaster in visual identity branding. A lobby is similar to the entrance in a home. Lobbies must be warm and inviting to visitors as the business is playing host in a professional space just the same way a host welcomes visitors into a house. Lobbies are also similar to living rooms but in a larger than life way. Essentially, lobbies are public spaces where people can linger to network or have conversations. If a lobby only serves as a lane of walkers coming and going, a company with its name on the building (even if tenanted by other firms) is missing a major opportunity to display its visual identity by appealing to market segments through use of colour and décor AND failing to be a courteous host and this is a negative image to portray to the marketplace. Lobbies see all types of visitors each day who associate the building name with their visit even if they are there to do business with another firm in the building. In a building named after a company, the company's branding starts with the exterior but makes the biggest impact in the lobby. If there is nowhere to even sit, the quality of the space is a big zero. Contact CULTURED IMAGE+ to learn more about our unique Cultural Image Service and how we can transform your firm's professional space with visual cues representing a sophisticated global edge and business savvy. geographically into new markets through their online presence as well as their physical space presence. New clients and customers are not only making virtual visits to a firm's website but are also personally visiting a firm's physical office space. This requires a firm's interior spaces be transformed to reflect the visual identity of the firm's branding in the revised context of the culture in which the firm is now operating. ​Cultural references are made through colour selections in décor including wall paints and panelling, fabrics, furniture, lighting and art. This does not mean a mishmash should ensue with a bit of everything thrown in for good measure. Careful planning by a decorating professional with knowledge and experience in international marketing, visual identity and cultural referencing is required to craft the perfect space promoting the desired visual identity. ​Contact CULTURED IMAGE+ to learn more about our unique Cultural Image Service and why it is a necessity for all professional firms operating in today's global marketplace. A firm can visually demonstrate its value for the people involved in its operations [employees, clients, consumers] by showing value for the surroundings in which its business is conducted. With the visible emphasis on the disconnect between mental-health in the workplace and the impossible achievement of trying to keep a job and maintaining a work-life balance, furniture manufacturers are tapping into a way to appease both sides of the chasm. Manufacturers such as Arper, Haworth and Teknion, are blurring the line between laid-back residential furniture and high-tech office pieces. ​Even home décor brand West Elm collaborated with Inscape to design a collection merging corporate practicality with comfy home feel. 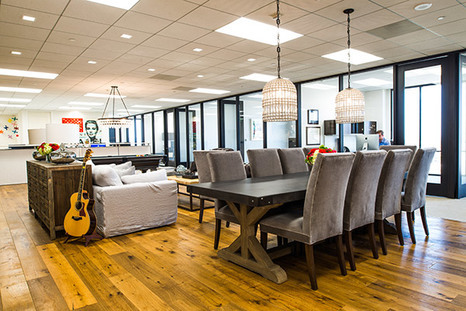 How can you create a community environment within an office? is a question West Elm's president Jim Brett likes to asks having already come up with the answer. He says, Work with a residential brand. 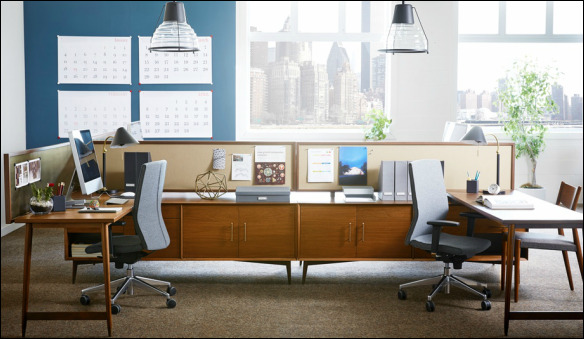 The new West Elm and Inscape line comes in three styles – modern, industrial and mid-century modern – designed to co-exist within an office space while giving each worker an individual identity and elements reminiscent of a home. The term 'home office' has an updated twist. An emerging trend is to bring residential interior styling into professional interior space decorating. People are spending so much time in work spaces, it makes sense to bring home comforts onto the scene. Installing interiors typically found in first class residences is gaining momentum throughout the United States and Europe. A setting utilizing residential décor is highly beneficial in making clients and visitors feel welcome as soon as they enter and, most importantly, aiding relationship building, which is the key skill-set of any successful business. Caution: The casual yet very high-end décor [as seen in the image above] works only for firms in more informal locations. 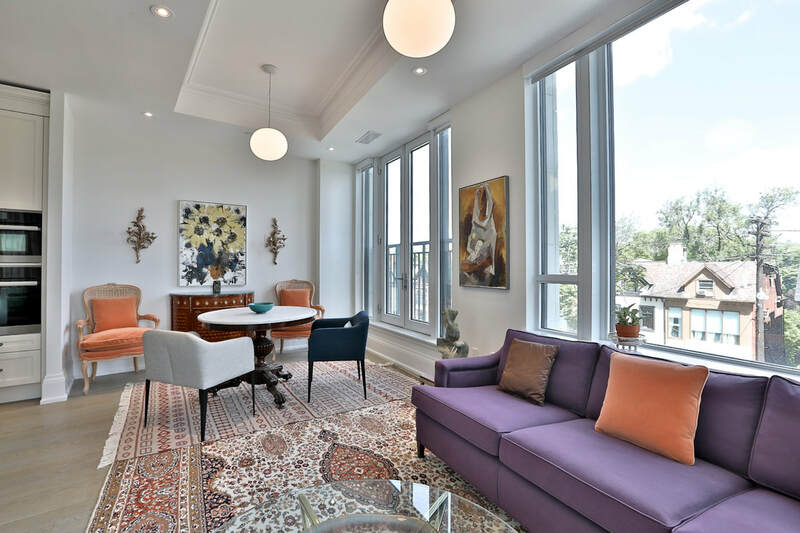 A better long-term investment for an established firm in a large city like Toronto, New York or London would be to apply hints of Euro-glam contemporary residential style [think Roche Bobois, Poltrona Frau or Knoll International] and use art work and focal colours to make the lucrative cultural connections. Legal clients are actively seeking law firms that are aware of global issues and offer innovative and creative solutions. In order to present this image, legal interiors need to be confident and bold yet comfortable. The effect is optimized with focal points of colour [bright blues, light brown and yellow are excellent for legal spaces]. A restrained yet obvious use of certain shades instantly affects the perception of clients making them believe your firm is current and bright-minded [bright colours correlate with bright minds]. Modern art work by artists representing certain countries or cultures adds essential cultural referencing. Enforcing the law of colour will market and brand you as a clear alternative to the conservative and uninspired firms out-of-touch with today's world. Floor coverings are an integral part of a décor​ plan for commercial space. Flooring needs to be durable but colour choice is crucial. Commercial grade carpeting, a popular choice in North American offices, is made for heavy foot traffic. However, the most commonly used colour, a solid dark grey, is the wrong choice. Colour psychology research indicates dark grey is perceived throughout the world [including North America] to be boring, uninspiring, uncreative and depressing. It can even provoke exit-seeking. European, Middle Eastern, Asian and South American cultures never use dark grey as a colour for expansive areas. If your firm courts clients [and has employees] from these continents, your décor must avoid this colour choice for walls and flooring. Carpeting with grey can be used as long as it is in the lighter shades or mixed with other colours. For example, light grey, similar to silver, is associated with prestige and wealth and seen as a sophisticated and modern colour. Grey combined with other colours, like brown and green, serves double duty by hiding stains and positively affecting the psyche of employees and clients [green and brown enhance creative thinking and imply a deep well of knowledge]. If your firm seeks to attract clients and retain employees, look down and review the colour of the flooring. Whether the décor theme is modern or traditional, a touch of chinoiserie works well in any professional space. It's a decorative element that immediately expresses an appreciation of distant lands and also offers a reassuring energy, making clients intuitively believe they are in the right place and will return. 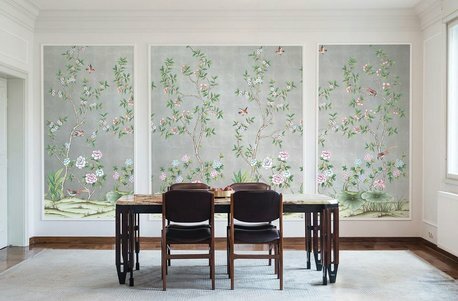 Hand-painted chinoiserie wallpaper, from Gracie or De Gournay, has been too expensive to justify until now. TEMPAPER has made the chinoiserie wall feature more accessible with the launch of a striking and affordable chinoiserie wallpaper line. It features 3 patterns in a range of colours from rich neutrals to a deep jade. Subdued metallic sheens are designed in 12 foot x 10 foot motifs and can be custom-sized to fit any sized wall. Starting at US $12 per square foot, they can be used as a wall covering or as individual framed panels. Installing the paper is easy: align the top of the paper with the top of a wall and smooth with a squeegee. Using visual décor elements from style-conscious homes instantly transforms a professional space into a welcoming environment, building client trust and encouraging more lucrative business deals and contracts. Client waiting areas are opportunities to influence mind-sets before the meeting. ​Teal is a colour proven to cause those viewing it to become open to suggestion. If clients are exposed to teal décor​ before a meeting, the hosting firm will have the upper hand in negotiations and more successful in sales. High-end light fixtures are an excellent choice over standard, institutional pot-lights. 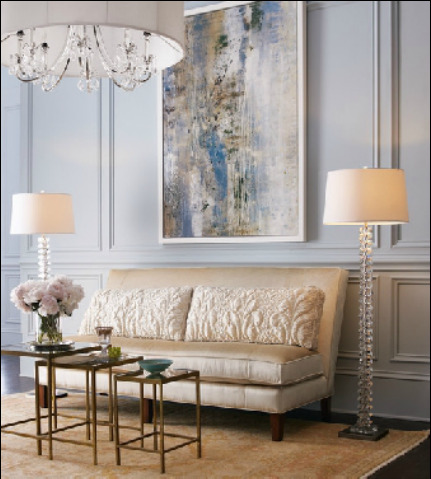 Layering, combining pendant lighting with floor lamps, provides warmth in your firm's waiting area. Lighting done right is a décor element demonstrating attention to detail. This subtle cue builds relationships and encourages client retention. Incorporating your company’s branding into office décor is paramount. Consider where and how to use your business name or logo, whether it's on custom made sofa pillows in the waiting area or a table in the shape of a product or item that identifies your firm or line of business. Issues like where to strategically place your business logo and the paint colour to use on a focus wall to represent your firm will have a powerful psychological impact when potential customers or clients visit your space.